With this loom, you have a nice shed, you can beat firmly and you have a lot of expansion possibilities. You can put it on the table or you can use a floor stand, the loom can have 4 to 24 harnesses, it can have a second warp beam, a shelf for weaving tools. 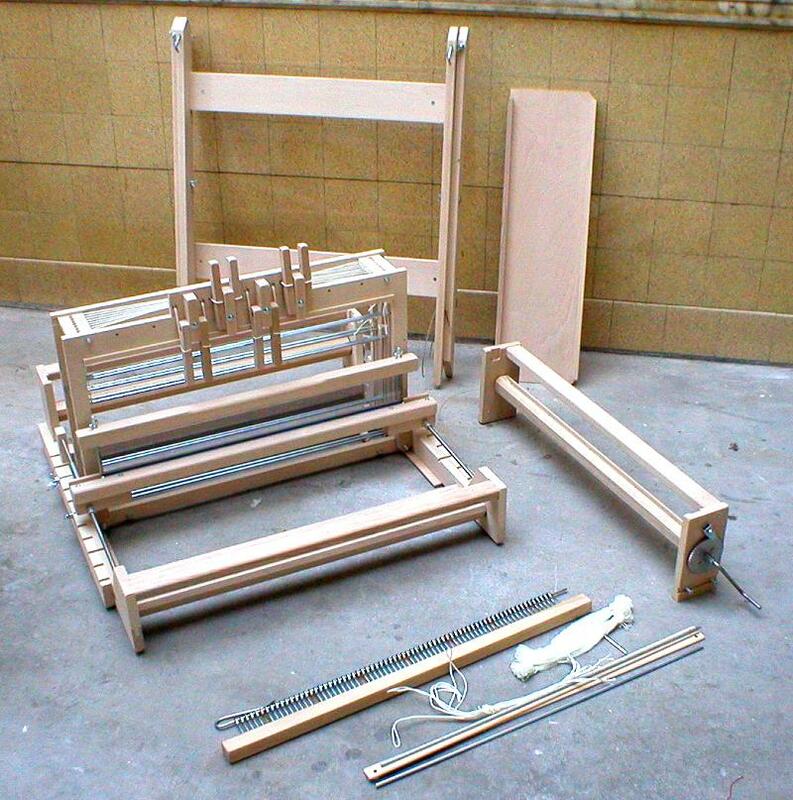 The loom can be supplied in bare wood (beech) or varnished. 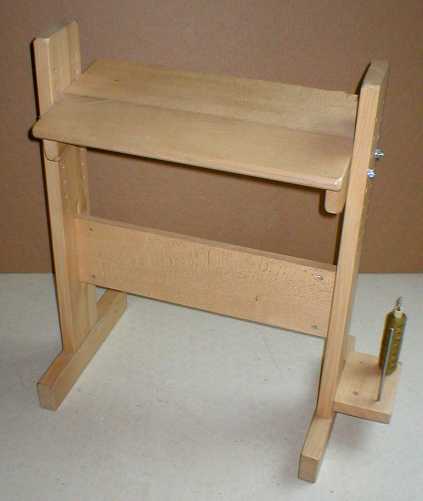 The breast beam is 15 cm above table height when you put the loom on the table. When you use the floor stand, you can weave comfortable with a chair of ordinary height (low floor stand), or with a higher chair (high floor stand). 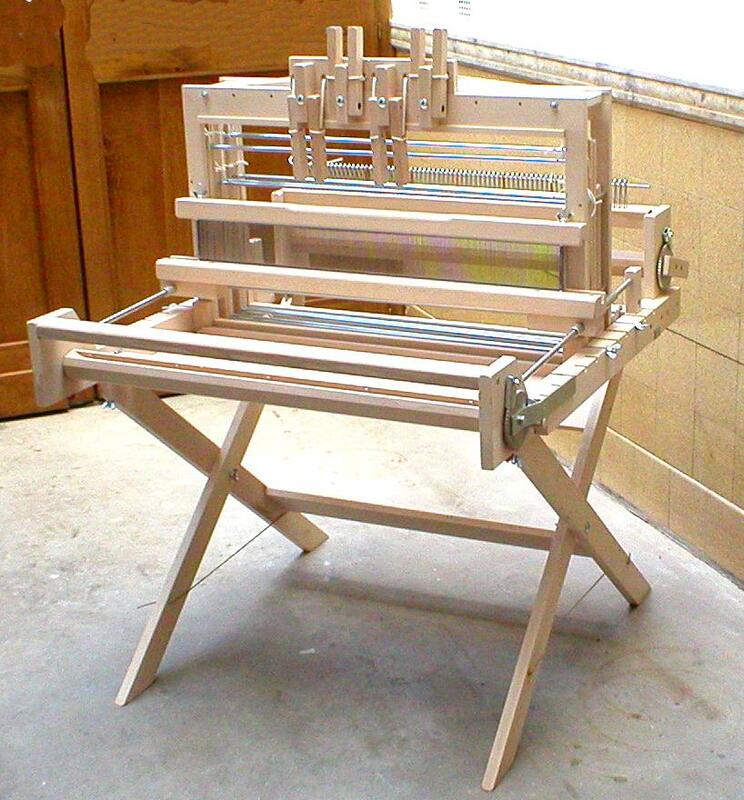 The loom is equipped with a beater that slides along two metal rods. In this way the reed is always vertical and beating goes in the best way. The beater's gliding system is equipped with ball bearings, so beating goes very smoothly. The loom can be supplied with 4, 8, 12, 16 or 24 harnesses. 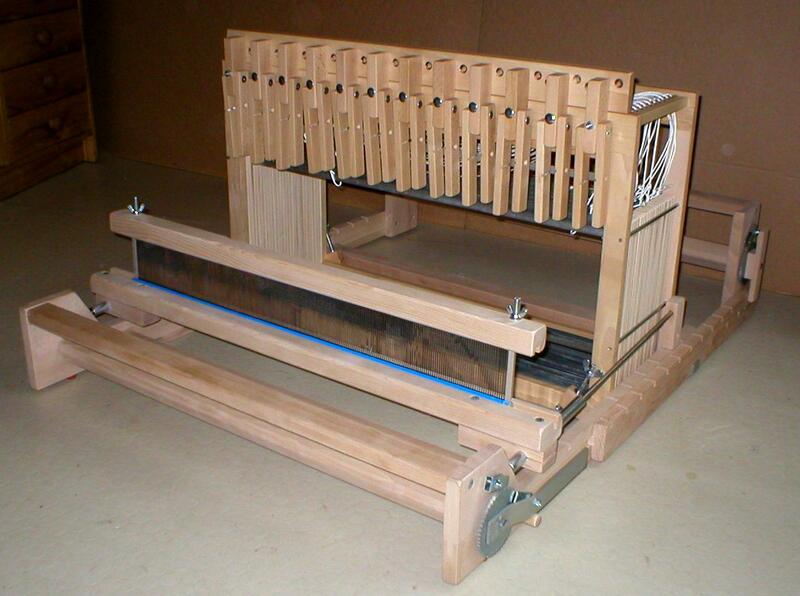 A loom with less harnesses can be expanded up to 16 harnesses. The castle (whole of harnesses and levers) of the loom with 24 harnesses has a different structure. The harnesses are closer together (8 mm), by default they are equipped with metal heddles. The levers are narrower because of the width of the loom. By extension to 24 harnesses, the whole castle should be replaced. Stretchbeam and warpbeam can be pushed up against the shafts, so the minimum depth of the loom is 90 cm. While weaving, especially with many shafts, the warp can be pushed backwards to a maximum depth of 130 cm. You can use Texsolv heddles or metal heddles, 28 cm in length. You can take out the shafts along the side of the loom. Even if the warp is already entered, still you can add heddles to the shafts. 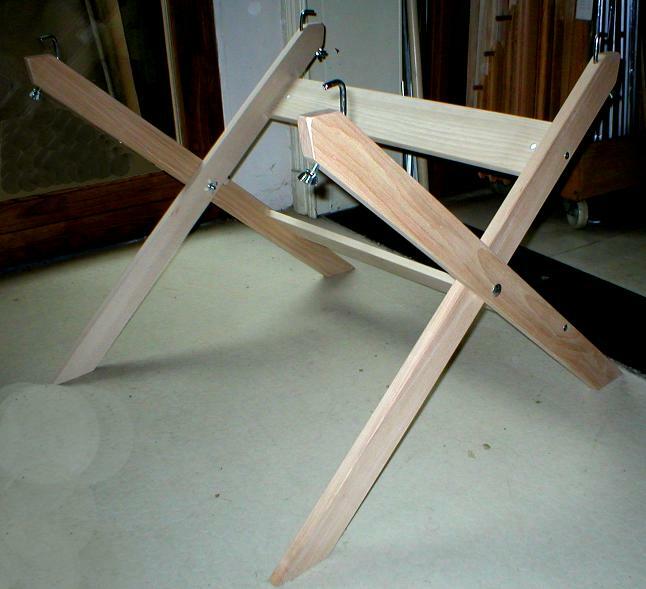 With the levers (in front of the loom), you can obtain a perfect, progressive shed: i.e. the harnesses at the back rises higher than those on front, so in front of the reed the rising warp threads are in the same plane. At the back you can mount a second warpbeam, at the front under the weave a shelf can be placed where you can put all kinds accesories (shuttles, yarn, scissors ...). Warpbeam and clothbeam are equipped with stainless ratchet wheels, so the warp can be tighten strongly.